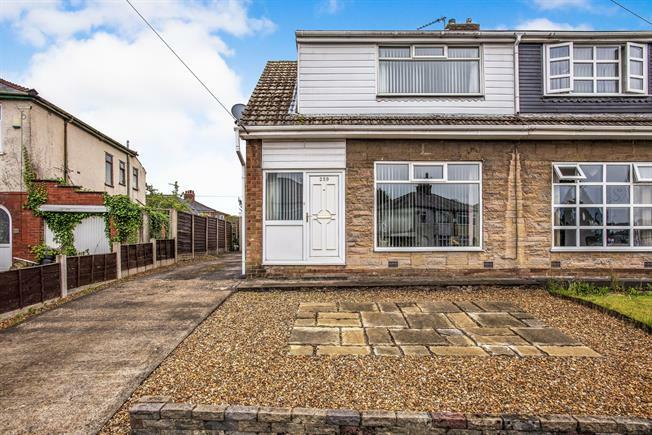 This well presented three bedroom semi detached home offers accommodation ideal to suit a wide range of aspiring home buyers. The accommodation on offer briefly comprises of a welcoming entrance hallway, light and spacious lounge, a modern fitted kitchen and the facility of a ground floor bathroom suite. Upstairs, you will find three generously proportioned double bedrooms, the master bedroom providing a range of fitted wardrobes. Externally, the property benefits from off road parking, a detached single garage and is surrounded by low maintenance front and rear gardens..
UPVC double glazed entrance door. Double glazed uPVC window facing the front. Radiator, carpeted flooring, under stair storage. Staircase leading to the first floor. UPVC double glazed door, opening onto the garden. Double glazed uPVC window facing the rear. Radiator, vinyl flooring, tiled splashbacks, wall mounted boiler. Roll top work surface, fitted wall and base units, stainless steel one and a half bowl sink with drainer, electric oven, gas hob, overhead extractor, space for washing machine, fridge/freezer. Double glazed uPVC window facing the side. Radiator, vinyl flooring, tiled walls. Low level WC, panelled bath, shower over bath, pedestal sink. Manual up and over door. Power sockets and lighting.